Why do you want city draw? Arsenal away to Watford then Napoli just 72 hours after? Ouch... Napoli will be much better at home. Hope Newcastle can get a result. I would take it 100% . Just for us to win really though is the most important thing and then we can get a nice draw between Liverpool and Chelsea. They will stay up either way. Leicester is pushing for europe and might get it if they keep getting the wins. I hope they lose 6-0 and get them relegation fear, so when playing Liverpool they go for a points. Is everyone else's NBC fecking up with the audio? It's nothing like that I just don't really like any of the Leicester players/manager all that much. We'll beat Newcastle either way, & if we don't, we simply don't deserve to win the title anyway. Why on earth would you want City to draw? The best case is that Liverpool draw (or lose! 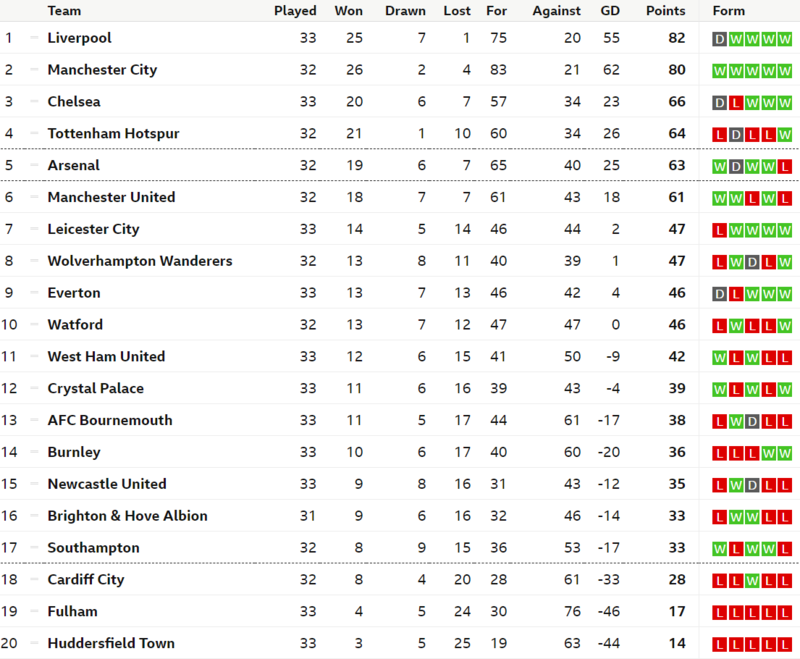 ), and City win, meaning we can enjoy taking points off them, rather than it horribly helping Pool out! As make no mistake, Sunday is the last chance Pool can possibly drop points. Look at their fixtures!! Possibly one of the only times ever I will be cheering on Chelsea. Even though you're competing with them for 3rd/4th? I think a lot of us don't see "top 4" as "That" important in the scheme of life. I don't think it's the be all and end all for signings, it's not really achieving anything, and it isn't the disaster some think not being in a tournament we're clearly not at the right level for. Slight edit ….I now see it was to a Tottenham fan not a United fan. However, I think Liverpool fans do overlook how unpopular they are, despite what the media will have you believe. Ndidi keeps giving it away. Handle the job on our end and we won't have to worry about Chelsea. Other than City we have very comfortable fixtures, even after Liverpool they still have to play United away and they're hardly all that convincing. If they take a CL spot off Arsenal (who have a lot of away fixtures) then great. Alongside playing City in the league we have Huddersfield, Brighton, West Ham and Everton at home, with an on the beach Bournemouth side away. If we can't get top 4 with those fixtures then like you say about your title challenge, we don't deserve to be in there. Also, feck Liverpool, feck watching Henderson lift the league/CL, that thought makes me wanna throw up. Perez gives Newcastle the lead. Brilliant header. City to drop form so Spurs and us can beat them. Would be nice if Palace could get something against them. Kasper Schmeichel doesn't half like striking a pose as the ball invariably sails past him. Do you understand what's going on here pal? If City drop points against Palace, we could be facing the absolute worst case, of Liverpool winning the league, and us playing a City team who are hell bent on beating us. We need City to beat Palace, hope Liverpool slip up v Chelsea, and THEN we (and City) know our game isn't as critical for them. Newcastle and Wolves are such a pain if you're trying to bet on the Premier League. They literally never win or lose when they should. Had them to lose 2-0 today like they absolutely should have done. Now they'll probably win 3-1 or something stupid. Put all of your money on Newcastle losing to Liverpool. That's beyond any doubt at all. Did it come off his shoulder? Terrible result for City, great one for Liverpool as it stands. 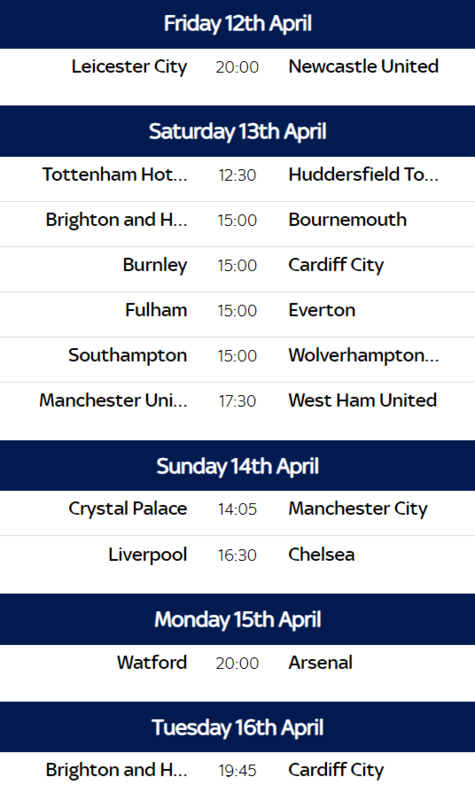 If it stays like this Wolves, Hudderfield and N'Castle will all have nothing to play for so the next 2 games are the make or break for Jurgen's men. Honestly if not Chelsea I don't think they are dropping points. Liverpool will have 2 meaningful opponents of the 5 to play. City have United, Spurs, Brighton who still have lots to play for, possibly Burnley too if they don't pick up a win v Cardiff tomorrow. No. Just looked again. Great header. See that bit of refereeing annoys me. Newcastle player lands awkwardly following a foul by a Leicester player. Referee plays advantage. Newcastle attack. Has a decent chance. Leicester win the ball back, and then referee stops play so Newcastle player gets treatment. You could say they've been a bit lucky this season. What I really respect about teams like Huddersfield and Cardiff is they lose the vast majority of the games they're supposed to, and you know they're unlikely to get a goal. I have a lot of time for teams that do as they should. Bit of a Puel esq performance from Leicester tonight. Newcastle done a good job on them and will be all but safe if they win this. Football gods been very harsh on Cardiff lately. Robbed them of three points v Chelsea, then had a two week break and in that time all their relegation rivals have won so they are pretty much relegated now even if they win a few games in the run in. Wolves can still get 7th and europa if you win FA cup. Apparently Almiron hasn't even set up a goal yet? Crazy hype when he signed. Still would imagine time to judge him is next season. Wolves are very predictable. Play tactical defensive football and do well against the bigger teams. Struggle to break teams down that don't give space for counters and let them have the ball. Leicester and palace are also great counter attacking sides. Newcastle is very much hit and miss though so I give you that. Bournemouth good against weaker teams, but not so good against top teams. Seem to have dropped off recently though. I guess with predictable you mean that you can bet on the team higher up the table to win. It works most of the time of course, but you need to watch how the teams play too to see which games suit them.